Hello Kevin I’m very much looking forward to all of your ideas I really like the idea of a Google like hangout very cool would love to be part of that.The greatest thing I feel is your ability to dissect with out putting your own spin on it That’s what really makes the podcast special.Its great to hear from people all over the world who share a common thread that which is Yes music. The new toys that you have gotten for Christmas are very cool I’m sure you will use them only to make what is all ready a great podcast but even a better one. I will be listing every week and you know I try to comment on every show only because I love Yes and your show just brings out the best of the best kinda like the frosting on the cake! Yes, thanks Paul, it does indeed look like a very exciting 2013 for the podcast. I will certainly be trying my hardest to develop things so we can go to a new level of collaboration and partnership. After all, without that interaction, there is no podcast at all. 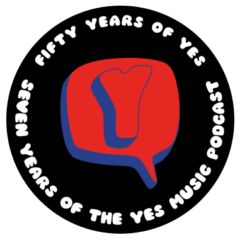 Of course, it’s also going to be another fascinating year for Yes as well – are you getting to go to one of the concerts on the tour?